The Coming Soon / Maintenance mode Ready! 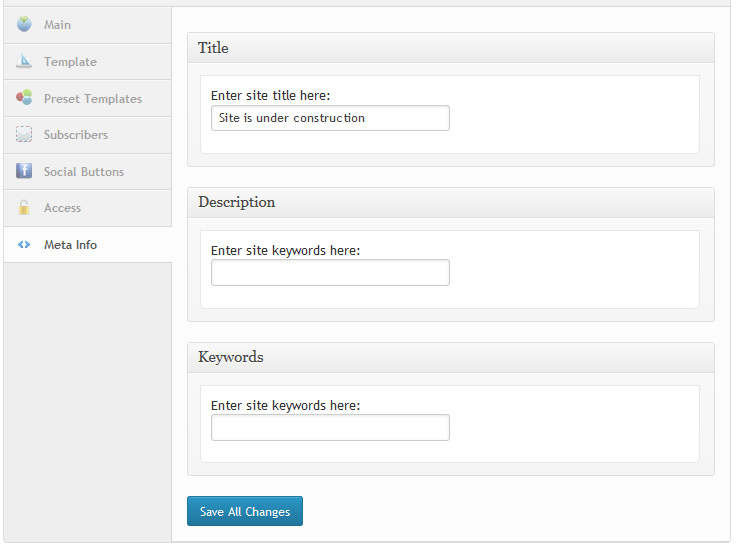 WordPress plugin is the best solution for your website, while it’s under construction. Professional and simple plugin to setup launch page, the Coming Soon / Maintenance mode Ready! works with any WordPress theme on any hosting. If youРІР‚в„ўd like to change a theme or edit templates on your site, to install some plug-ins or even make backup copy, you really need Coming Soon/Maintenance mode plugin to close the site from all the visitors while providing access only for yourself and some selected users, for example, for administrators. This will allow you to reduce the load on the website while itРІР‚в„ўs under construction avoiding loosing the users and even deriving some benefit from the situation. The plugin is provided with data capture features like the possibility of collecting e-mail addresses enabling you to use this valuable information in your future marketing strategy. Another scope of this plugin is situations when you are going to open a new website and would like to attract some attention to it or to invite users of your existing website to a new one. Coming Soon WordPress plugin is a great tool that you can use for announcing and promoting your new project even before it launches. Visitors will be able to see a kind of announcement informing them about time left until the project launch, giving some idea about website topic and design and even encouraging them to visit some associated recourses like Twitter and Facebook pages. Social follow icons as well as share buttons are provided for wider functionality. Once you install and adjust the plugin you can work on the site while users, including unregistered ones, will be able to see Coming soon page for which pre-set templates are available as well as the possibility of customizing it in accordance with the site design. Also you can grant some of your users the access to the site without logging in via secret link allowing them to bypass Coming soon page. You are enabled to allow/restrict users access by IP address or User Role and to include/exclude URLs for limited displaying of the landing page. – Automatic download of updates via WordPress Dashboard. To use this plugin you donРІР‚в„ўt have to be a professional in coding as it is not required and the user-friendly interface guarantees fast and easy activation and editing. You are free to customize colors, fonts, sizes, layout and many other features. Integration with Google Fonts and Typekit allows even more space for creating unique solutions. Social features are not limited to icons and share buttons but are supplemented with built-in Referral and Tracking System allowing conducting contests or viral marketing options. You can store emails in the WordPress database and capture name along with the email due to integrated solutions among which there are MailChimp. Other tools include under construction countdown timer for users to know when the website will be accessible, Maintenance Mode informing search engines about the current website status, Landing Page Mode to use the plugin effectively after website launching and much more useful features and possibilities.